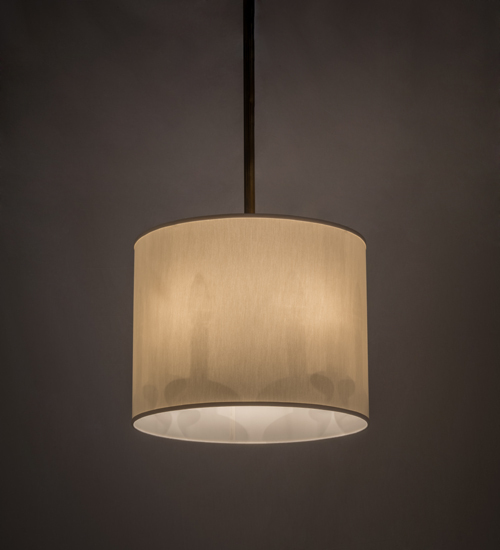 Description: Created with a clean round profile that fits into any interior, this pendant features a sophisticated aesthetic that will add character to any room. This Cilindro provides a distinctive Eggshell Textrene fabric shade which reveals an open-design that offers an inside look at the decorative four-light cluster featuring an architectural design and ballpoint accent while evoking brilliant ambient illumination. All of the decorative hardware is offered in a stunning Antique Copper finish. Handcrafted in the USA, this fixture is available in custom colors, styles and sizes, as well as dimmable energy efficient lamping options. UL and cUL listed for damp and dry locations.